During the holidays everyone is sure to have some candles burning - there's something about them that just lend a magical festivity to everything. At the end of every season though, I have all these little bits of candles left over that I don't know what to do with, so I was excited to find this DIY activity. Make these adorable 'tea' lites as eco friendly gifts, or just repurpose them for yourself, they're sure to be a conversation peice at a holiday party. Find old teacups with personality at any salvage shop; in Canada try the Salvation Army or Goodwill. Click here for the full tutorial. If you want a healthier version, try beeswax instead. (Beeswax is infinitely better for the air quality in your home; they actually help purify your space. You can tell how dirty the air in your home is by how black the wax around the wick gets. YIKES, you may not want to know! Beeswax is more expensive to buy, but you get your money's worth as they last A LOT longer than paraffin candles.) You can usually buy just the wax at your local healthfood store. Have fun! thanks so much for shedding some light with this brilliant idea! 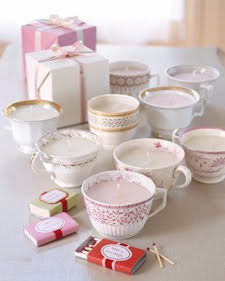 there are so many sweet little tea cups just begging to be used this way ... love it!